A French auction house has announced that it is putting up for sale a large number of katsinam – objects sacred to the Hopi tribe of Arizona – just months after a similar auction caused an international furore. Survival International, the movement to support tribal peoples, is going to court to try to stop the auction. Alain Leroy of auctioneers EVE plans to auction 25 katsinam on 9 and 11 December, despite pleas from the Hopi’s religious authorities to cancel the sale. The auctioneers have ignored requests to suspend the sale. Lawyer Pierre Servan-Schreiber of the firm Skadden, Arps, acting for Survival International and the Hopi, will go before a judge in Paris on Tuesday in an attempt to have the sale blocked. In April this year the French firm Neret-Minet Tessier & Sarrou auctioned 70 katsinam for €930,000, ignoring pleas from the Hopi and protests around the world. Actor Robert Redford called the auction a ‘criminal gesture’ and a ‘sacrilege’ and called for the objects to be returned to the Hopi. 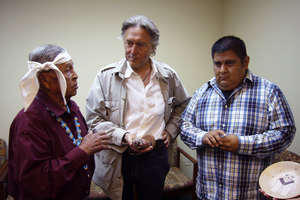 Pierre Servan-Schreiber, who also acted for Survival and the Hopi in that case, later bought one of the katsinam at the auction and returned it to the Hopi this summer. Any public display of the katsinam, including in print, television or online, is considered deeply offensive and disrespectful to the Hopi.